Reparto: Brad Pitt (Gerry Lane), Mireille Enos (Karen Lane), Eric West (Jason), James Badge Dale, Matthew Fox, David Morse, Michiel Huisman (Ellis), Gio Dangadze (Tyler), Katrina Vasilieva (Valentina), Fana Mokoena (Thierry), Sterling Jerins (Constance Lane), Mustafa Harris (Lincoln). 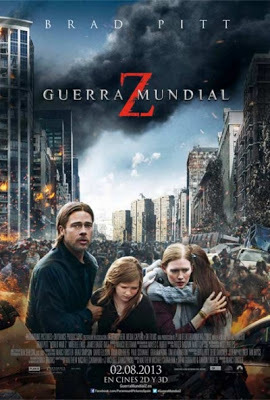 Guión: Matthew Michael Carnahan y J. Michael Straczynski, basado en la novela World War Z: An oral history of the zombie war de Max Brooks. Producción: Ian Bryce, Dede Gardner, Jeremy Kleiner y Brad Pitt. Montaje: Matt Chesse y Roger Barton. Productoras: Plan B Entertainment, Apparatus Productions, GK Films, Hemisphere Media Capital, Latina Pictures, Paramount Pictures y Skydance Productions.